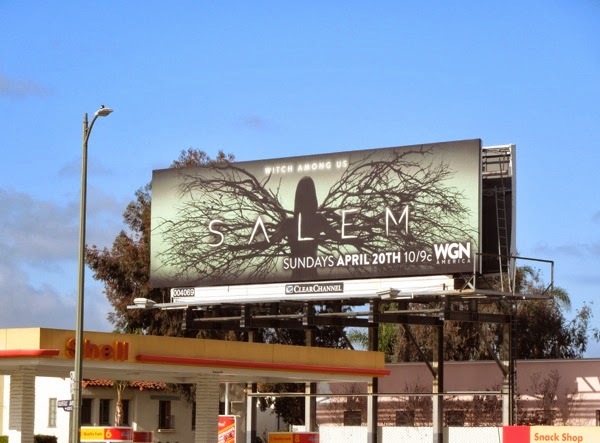 With such an evocative TV series title as Salem, you know that you're going to need an equally distinctive and intriguing billboard to sell the show to prospective viewers and Daily Billboard thinks that WGN America has succeeded with this eerie ad creative. 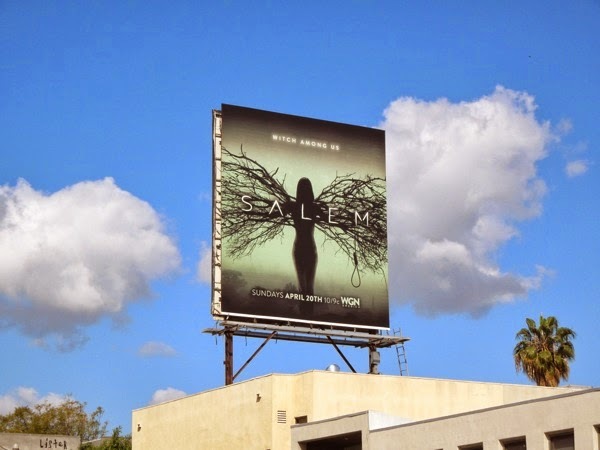 This creepy billboard which looks like a winged woman with her wings made of tree branches, almost like an alien butterfly, with a noose hanging from those branches in the squarer creative, is for the cable channel's first original scripted program about the real Salem witch trials in 17th century Massachusetts. 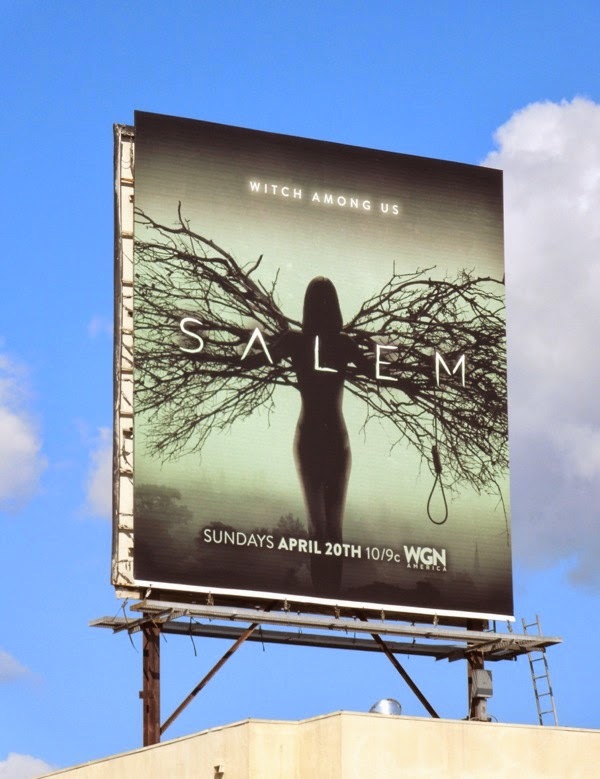 Witchcraft and nature go hand in hand so this is a clever visual for the new supernatural series, especially opting for a green colour which immediately evokes such iconic villains as the Wicked Witch of the West, and no doubt many suspected witches were hanged from trees as well as being drowned or burned at the stake. 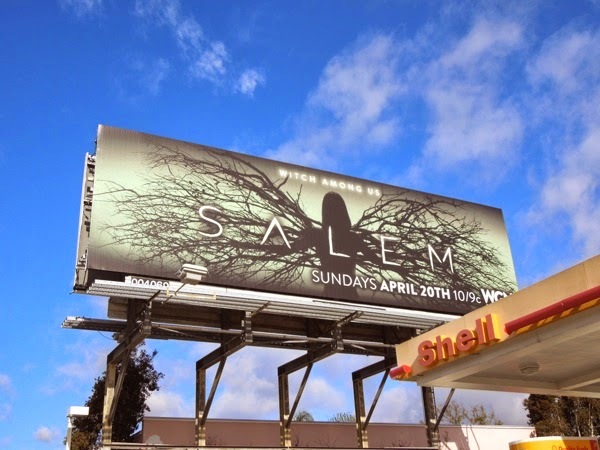 Created by Adam Simon and Brannon Braga, Salem stars the short-lived Made in Jersey's Janet Montgomery as the town's most powerful witch 'Mary Sibley', with Revenge's Ashley Madekwe as her loyal accomplice 'Tituba'. 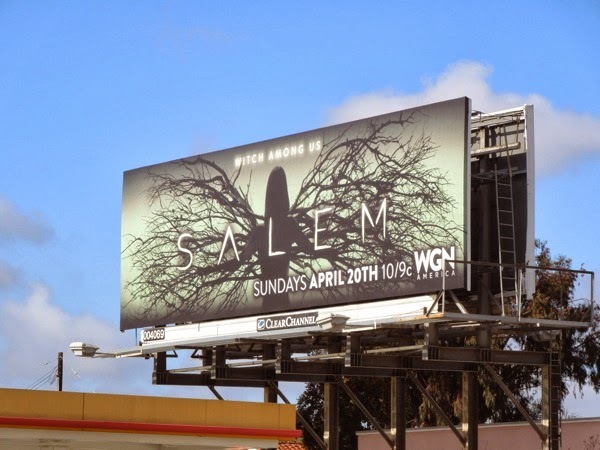 Fringe's Seth Gabel as 'Cotton Mather' also stars as the religious leader of the local witch hunts and Nikita's Shane West plays 'John Alden', a returning war hero faced with this witch hunt frenzy. 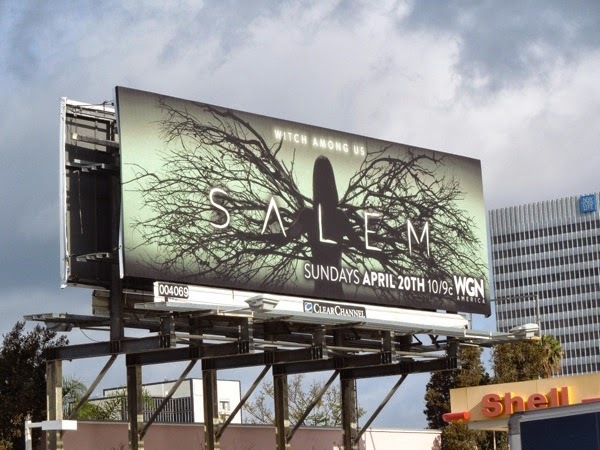 Now the real question is whether this historical drama is coming late to the witching hour, with the likes of Lifetime's Witches of East End and FX's American Horror Story: Coven having already delved into this spellbinding genre on television recently. 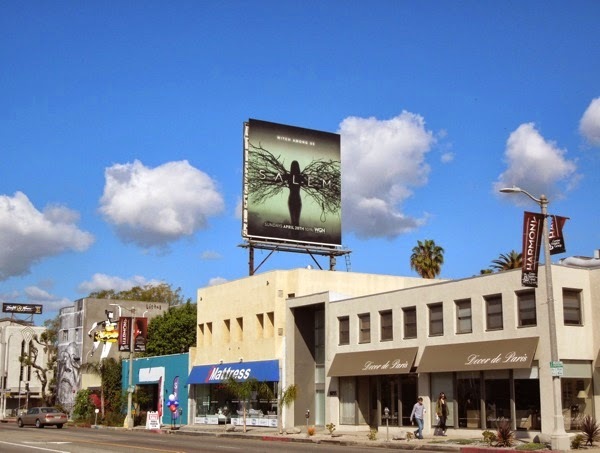 Regardless of its chances, this is still a striking and macabre billboard ad creative and certainly caught Daily Billboard's eye in both formats, spied above Beverly Boulevard and at the intersection of Fairfax Avenue and Olympic Boulevard on March 19, 2014, and should be enough to make people sit up and take notice, and maybe even tune in.